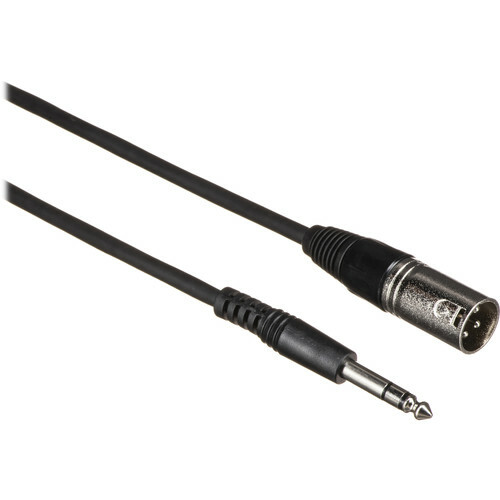 This Comprehensive EXF 1/4" TRS Male to XLR Male Cable is a high-quality cable for a variety of audio applications. EXF-series audio cables employ 100% Microweave bare-copper shielding and CFP low-loss dielectric. It is finished in Comprehensive's X-traflex black matte, non-glare jacket. Box Dimensions (LxWxH) 6.5 x 6.2 x 1.0"
EXF Series 1/4" TRS Male to 3-Pin XLR Male Cable - 10' is rated 4.7 out of 5 by 10. Rated 5 out of 5 by Robert from Great cables at a great price I bought a pair of these for my monitor speakers, which are part of a DJ recording studio. The cables have a very good quality and compared to the price for similar cables, these are terrific purchase. I will buy more as I add more speakers. Rated 5 out of 5 by Ryszard S. from Good quality cables Now,economy impact my life and I just can't afforded Mogami Gold cable. I decide to try this Comprehensive and I don't see any problem. Cables working very good, no problem yet. Rated 5 out of 5 by Les_G from Solid Product Has good sheilding and was a better pice compared to products with lesser sheilding and specs. Used for a short run from mixer to powered PA speaker and very low noise if any. Rated 5 out of 5 by Brian A. from Solid cables at a good price Not much to say about these. They work nicely and have a good length for what I need them for. Good general purpose TRS-XLR cables. Rated 4 out of 5 by Anonymous from Useful product Used to connect mixer output to amp rack. No problems.